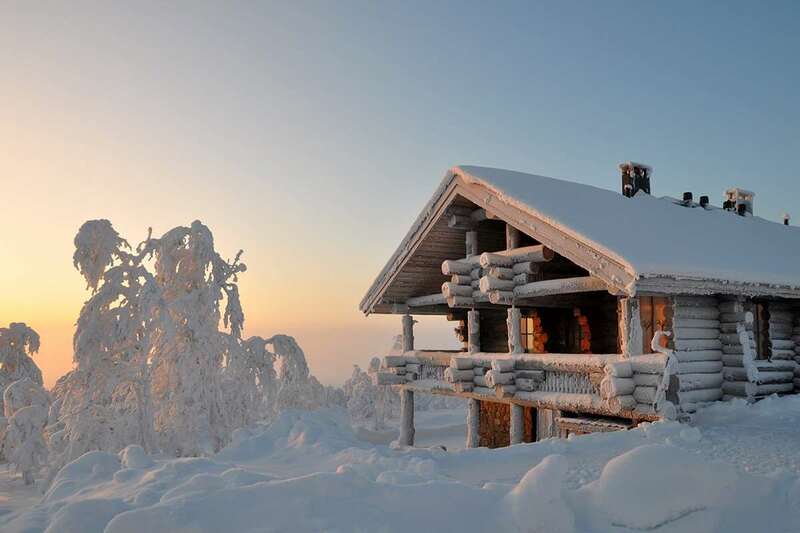 Located in the far north of Finnish Lapland, 250km above the Arctic Circle, Saariselka is a small resort, with a handful of hotels and private cabins, literally in the middle of nature. It enjoys wonderful views across surrounding fells and easy access to the forest trails, whether it be for hiking, skiing or safaris. 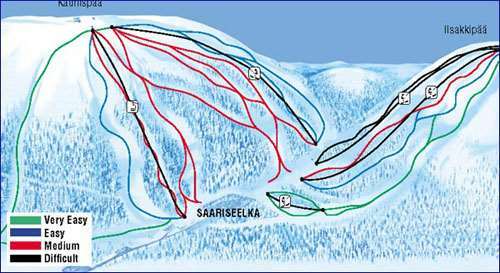 The natural beauty of Saariselka is truly spellbinding and provides an enjoyable variety of runs. Even though there are several excellent accommodation options in the area, visitors are never far away from the tranquil Finnish wilderness. The combination of extraordinary scenery and incredible hospitality help to make this a leading wintersports destination. With 200km of well-maintained cross-country routes and 15 slopes suiting all abilities, it’s easy to see how Saariselka continues to attract thousands of visitors every year. The ski season takes place between December and April and the terrain is expertly groomed, ensuring a great skiing experience for holidaymakers. The runs here stretch to a total of 10km, with the longest being around 1.3km. Many of the routes here are suited to beginners or intermediates, though there are some for more advanced skiers. Some of the most popular routes begin on the Kaunispaa and Lisakipää fells before falling away around a third of the way down, leading to an exhilarating ride in one of Europe’s most picturesque regions. There is a great selection of bars and clubs across the resort, with the Gold Panner Bar and the Holiday Club two of the most popular places to relax after taking on those stunning runs. For a livelier atmosphere, the Tunturi hotel is one of the top options, offering plenty of live music and an incredible drinks menu. Overnight stay in a luxury glass igloo – Just a 20 minute drive away in Kakslauttanen, this unique trip is the perfect way to observe the Northern lights from the comfort of your own bed in a stunning winter wonderland. Sauna, transfers, breakfast and dinner is included in the prices. Northern Lights Wilderness Dinner – This 3 hour excursion includes a 12km scenic drive to the wilderness hut, a delicious meal cooked over coals and stories about the Northern lights by the hosts. The hut is perfectly located to view the lights should there appear. Husky safaris – This 2 and a half hour excursion includes a 20 minute drive to the farm and 1 and a half hours at the farm. Experience a husky ride through the wilderness followed by a hot drink by the fire. There are various options starting from a Husky Mini Safari with a 2km sleigh ride to a Husky Half Day safari with a 15km safari and lunch. Reindeer Safari and Sámi reindeer farm visit – Just a 15 mins drive away is the local Sámi reindeer farm. Spend 1 and half hours at the farm feeding and learning about the reindeer before a scenic sleigh ride and a hot drink in front of the fire at the end of the visit. Snowmobile safaris – 2 hours excursion starting from in the resort. Enjoy a 25km ride through the breathtaking artic scenery. The safari is available during the day as a family friendly trip or in the evening ‘In Search of the Northern Lights.’ Longer trips can be booked in resort. Snowshoeing Safari – A 2 hour guided tour can be taken during the day or in the evening in search of the Northern Lights. Visit Santa’s Home – 1 hour drive away deep in to a magical snowy wonderland children get to meet Santa and his elves. Visit the reindeers and see how the elves send presents around the world, plus many other activities. Sámi Museum and Inari Village – A 5 hour excursion the village of Inari on the shores of a huge lake where the Sami have hunted for centuries. Learn about their rich history and culture at the Siida museum and browse the brilliant shops and boutiques in the village. Nellim and Russian Border Patsjoki Bridge – This 5/6 hour excursion takes you across the rolling hills to the taiga snow forests of Russia. The visit includes lunch at the Nellim Wilderness Hotel, a visit to Nellim village’s Russian Orthodox Church and the Patsjoki river bridge. Flights are available from Gatwick and Manchester most of the season with flights on selected dates available from Bristol and Stanstead. Once in Finland the transfer is around 3 hours by coach or minibus to resort. I had the most fantastic week in saariselka and the snow conditions were among the best I have seen - far better than the alps! Yes, it was cold - around -35 with a wind chill of -40 and below, but it was true powder snow and fabulous scenery. The resort is very clean and the staff/locals were all very friendly. I will definitely be going back in the future.